How many times do you push fantastic fundraising ideas to the side because you don’t have time to implement them? The Operational Efficiency Growth Track is designed to lessen the burden of administrative tasks through smart tech tools and automation. The track begins with features in your core DonorPerfect system like integrated online donation forms with integrated payment processing that send gift and donor information into your DonorPerfect system for you. You can then choose to simplify other ongoing duties that take our team away from mission-minded tasks like check processing and accounting. With the Online Fundraising growth track, extra features can be added onto your core system to get the most out of online giving. Just because check donations are the lifeblood of your organization doesn’t mean you have to spend so much time processing them. DP Check Scan simplifies check processing by using scan technology to transmit check information directly into your DonorPerfect system and give you the option to electronically deposit checks for same-day availability. With DonorPerfect’s QuickBooks integration, there’s no need to re-enter fundraising data into your accounting software. Simply summarize gift transactions with General Ledger Codes and gifts will automatically post to QuickBooks. You specify the transfer period that works best for you. DonorPerfect Payment Services offers a single PCI-compliant solution for all of your organization’s payment processing needs. One merchant account that covers online donations, recurring monthly gifts, payments accepted for services, cashiering at auctions and events, online store sales, check processing, credit card payments in person or over the phone, and an account updater service that can automatically update most expired or replaced credit cards. Find the right tools to help your nonprofit succeed. 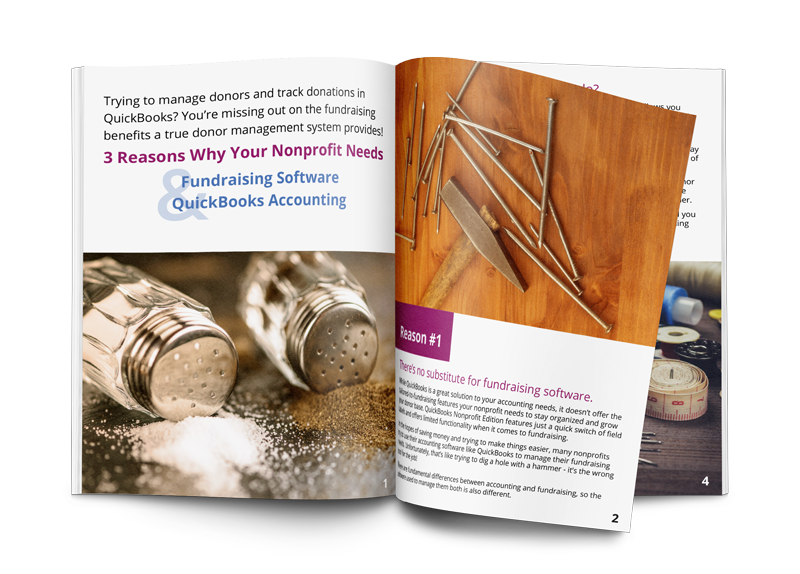 Get the nonprofit accounting e-book!